Mine were started last night in the heated propagator to give them some bottom heat they are indoors, once germinated they will move under a grow light panel so they dont become leggy and grow towards the light. 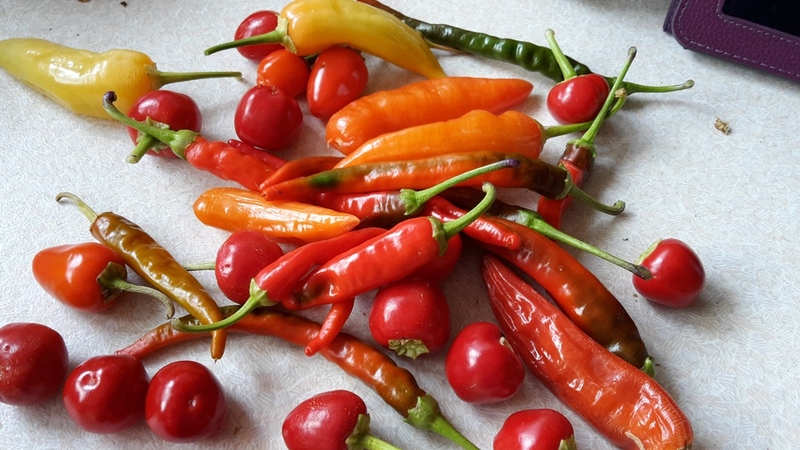 I and growing a mixed lot and some piquant peppers, the hottest we have ever grown was Dorset Naga, Martin likes a hot chilli but these were so hot you could only have a very small amount. I'm also a bit of a hothead when it comes to food. Used to grow Nagas and Trinidad Scorpions, some of the worlds hottest and boy did they have a kick to them! i've grown apaches before too, good yeilds of small medium/hot chillis from those, good reliable little plant. I've got some Scotch bonnet, Scorpion Moruga and Habanero seeds if you want to do a seed swap and try some of the HOT HOT varieties? I sow my chilli seeds on boxing day. In doors. I love the ones called Mouse sh^t in Thai. I dont know what they are called in English. I have a plant that lives outside in the summer indoors in autumn/winter. I grow so few that it's easier for me to buy plants. I grow 2 types 'Doux long des Landes' which is a non-hot chilli for frying as Tapas (delicious), and 'Impala' which is a hot devil for curries etc. Neither of which are probably available in the UK. I sow mine around about now, but just in a windowsill propagator. Then they go out into the greenhouse after the frosts. They always seem to do pretty well.